Hands down, my new favorite hand pies. 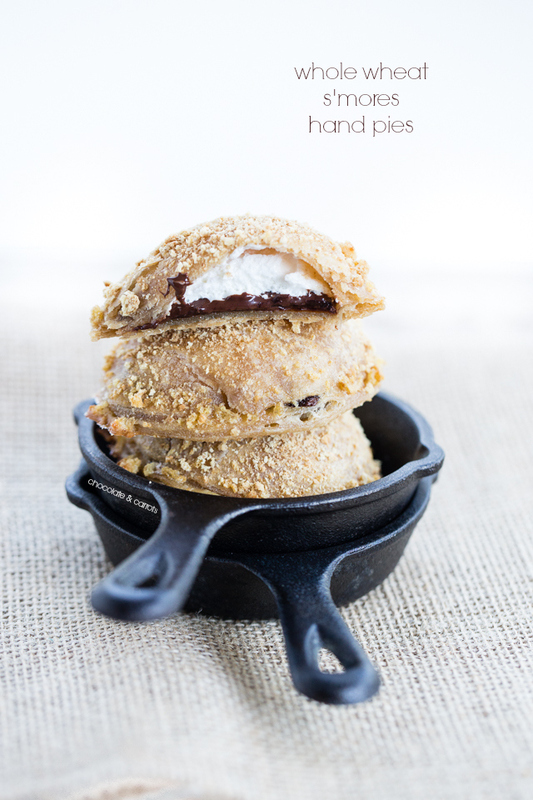 S’mores in a little pocket is the greatest idea ever. And when enjoyed warm out of the oven, the chocolate is melty and marshmallow is gooey. Just the way I like them! A little off topic from Pie Week, but today is my husband and my 5th wedding anniversary. We’re headed to Pembroke, Virginia to attend Mixed Conference with McCormick and couldn’t be more excited! To add to the craziness, we’re moving to Charleston on Monday. My life is nuts exciting. 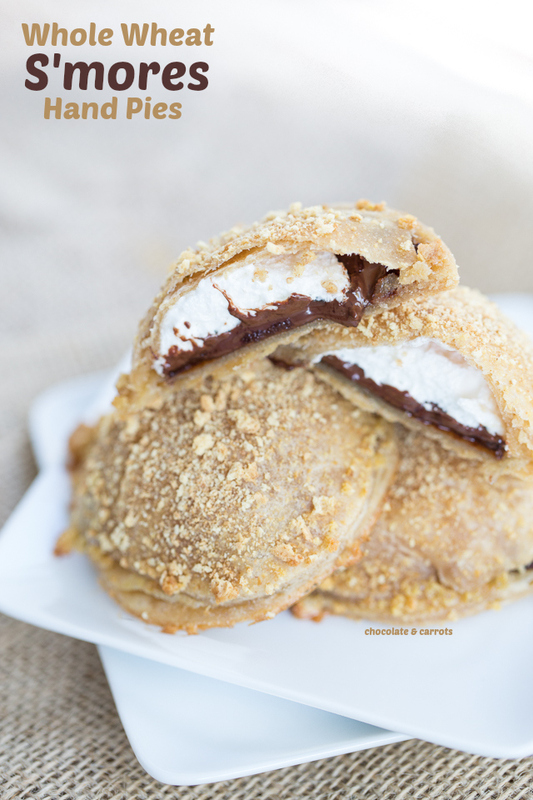 Eat a S’mores Hand Pie. Preheat the oven to 350°F. Line a baking sheet with parchment paper or a silicone baking mat. Roll out the chilled pie crust on a floured surface until it’s about 1/8″ thick. Cut 3 1/4 inch circles out. In a small bowl, beat the egg and water together to make an egg wash. Brush the egg wash lightly over half of the circles. Lay one square of chocolate on each circle. Scoop 1 tablespoon of marshmallow fluff to top of each chocolate piece. Gently stretch out the other circles and place them on top of the egg washed circles that have been covered with chocolate and marshmallow fluff. Press down the sides. Place them on the baking sheet. Brush the pies with egg wash and sprinkle with graham cracker pieces. Bake for about 10 minutes or until lightly golden brown. Note: You may need to poke a tiny hole in the top of the pies to allow the marshmallow to expand. I didn’t and it cracked on the top as it rose with heat, but settled down after cooling. This post was sponsored by Kitchen Aid. I received no compensation for this post. All opinions are my own. Please read my disclosure policy for further information. What cute little pies! They look so perfect and unmessy unlike the real s’mores. Love these! So gooey and delicious! Yum, great recipe! I’ve been on a s’more kick ever since I made homemade marshmallows earlier this week! First of all- Happy Belated Birthday and Happy Anniversary!!! Also- your adorable hand pies have just been to cute this week- this one looks so rich and decadent- I love them! Have a great time at Mixed and I would totally have a batch of these for the road!! I am LOVING all your hand pie recipes this week! I think these are my fave tho! When life is crazy, eat s’mores. I think this is our new motto. I feel your pain on the moving craziness. We close on a house January 3rd! Ohmygawsh those are gorgeous. I must have them! Pingback: Triple Fruit Slab Pie and a Kitchen Aid Stand Mixer Giveaway!